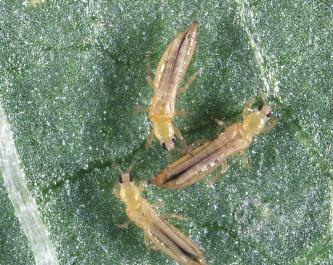 Western flower thrips (Thrips frankenelli) and some other thrips species. Cucumeris does well in humid areas above 65% and in crops with heavy foliage. It is used successfully in many protected crops, including tomatoes, capsicum, greenhouse vegetables, cut flowers and ornamentals. This predatory mite has been produced commercially for many years in Europe. It feeds on the larval stages of thrips and some mites. It is part of a large group of predatory mites called Phytoseids. This species is now available in Australia. Typhlodromips montdorensis, a species indigenous to Australia has also been developed as a biocontrol of thrips for use in Australia. The adult predatory mite is cream coloured, while the younger stages are clear. Both forms are pear-shaped and fast-moving. Predator eggs are clear and slightly oval and about 1.5 times the size of a twospotted mite egg. Cucumeris feed on 1st and 2nd instar thrips larvae. Or view or download a PDF file of the Book entry for Cucumeris.